The exact position of a satellite orbiting a celestial body such as the Earth or the Sun can be found using six control variables. The first five are characteristics of the satellite's orbital path. The semimajor axis and eccentricity describe the size and the shape of the orbit, which is restricted to an ellipse here. Inclination and the longitude of ascending node are used to position the orbital plane in space, while the argument of periapsis describes the orientation of the orbit within that plane. True anomaly, the only variable that changes with time, positions the satellite within the established orbit path. This Demonstration is initialized assuming an artificial satellite in a geostationary orbit, which means that it is circular, equatorial, and prograde, has a period of 24 hours, and orbits the Earth. This is common with many manmade satellites, maintaining their location above the same spot on the Earth. Changing the "Satellite" option to "Moon" shows the current location of the Moon with respect to the Earth, and changing the option to "Earth" shows the Earth's current location with respect to the Sun. Snapshot 1: When , the orbit is circular. Since the satellite is always at the same distance from the Earth, the radius of periapsis (the distance between the satellite and the central body at its closest point) is undefined. The argument of latitude replaces the longitude of the ascending node and the argument of periapsis, and is the measure from the ascending node to the satellite's position vector. 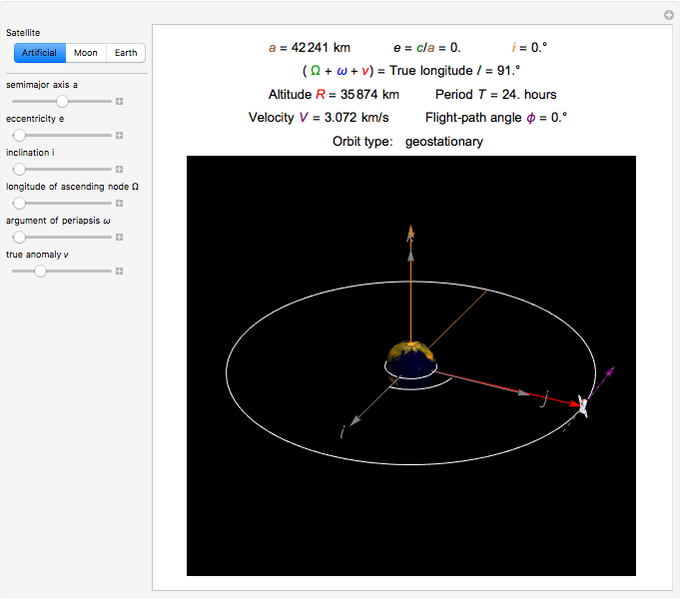 Snapshot 2: When or , the orbit is equatorial. In this case, the satellite is always directly above the equator of the Earth, so the ascending node (where the satellite passes from the southern hemisphere to the northern hemisphere) becomes undefined. The longitude of periapsis replaces the argument of periapsis and true anomaly, and is the measure from the principal direction (toward the constellation Aries or toward the Sun on the spring equinox, also known as the vernal equinox direction) to the radius of periapsis. 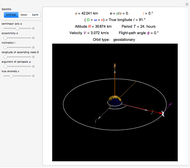 Snapshot 3: When and or , the orbit is both equatorial and circular, and both the radius of periapsis and the ascending node are undefined. The true longitude replaces the longitude of ascending node, argument of perapsis, and true anomaly, and is the measure from the principal direction to the satellite's position vector.